An Illinois couple claim they received this rag instead of a burger from a local McDonald’s restaurant. 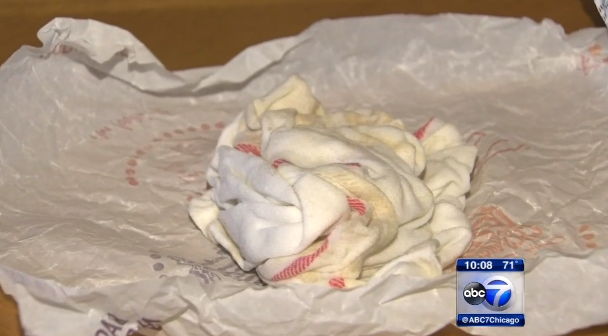 The pair tell ABC7 WLS in Chicago that the double cheeseburger they ordered at a local McDonald’s restaurant turned out to be a wet rag instead. The couple ordered their meal from the drive-thru at the Golden Arches and headed home to eat. After unwrapping the not-so-delicious meal, they called the restaurant. The manager of the restaurant – who did eventually apologize to the couple – tells WLS that he is taking the matter seriously and currently looking into the claim.